Analysis: Who’s rising and who’s falling in the Pac-12 recruiting ranks? The Pac-12 Hotline takes stock of which programs are on the rise and which ones aren't when it comes to the competitive world of recruiting. With Wednesday’s national signing day in the rear-view mirror, Bay Area News Group’s Jon Wilner takes a look at the state of Pac-12 football recruiting — who’s rising and who’s falling? The division dominated the regular season and continued its momentum through the early signing window and into February. No. 7 Oregon, No. 19 Washington and No. 23 Stanford. USC (17th) was the only South team in the top 30, in fact. Team-specific assessments are below, but it’s difficult to survey the coaching, returning personnel and incoming talent and conclude that balance will return to the conference in the next few years. Too many schools in the South are too many years away from high-level play. One number connected to Oregon’s stellar recruiting class intrigues the Hotline more than any other, and it’s not 7 (the Ducks’ national ranking in the 247sports composite). Like Washington’s Chris Petersen, Oregon coach Mario Cristobal knows well the value of power on the line of scrimmage, and this class — his first beginning-to-end as head coach — is heavy on heavies. Four linemen (two offensive, two defensive) are on the plus side of 300. That group doesn’t include the No. 1 signee in the west, edge rusher Kayvon Thibodeaux, or a 270-pound strong-side end, Brandon Dorlus. Look at it this way: Cristobal has almost as many 300-pounders arriving as he does running backs and receivers. 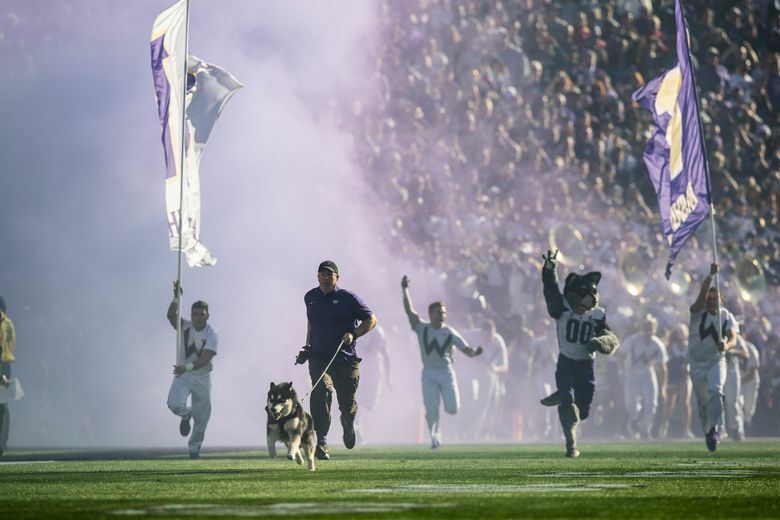 It indicates an uptick in the caliber of players UW is targeting regularly — OKGs with elite talent — and underscores what Petersen did with classes that didn’t rank at the top of the conference. And the Huskies are strong where they have been strong and the rest of the conference has been weak: The defensive line. Three incoming players (two tackles and an end) are ranked in the top 10 nationally at their position. Not much sizzle to the class but a nice bounce-back for David Shaw. His program got caught short (with numbers) last season but was more aggressive in this cycle. 2018 class: 15 players, five of which carry four-star ratings, and seventh in the conference. 2019 class: 23 players, eight of which carry four-star ratings, and fourth in the conference. Nope, there isn’t a substantial difference in the number of four-stars, but I’m not sure that matters. Because Stanford recruits to an established system, it frequently turns three-star prospects into high-level players (Harrison Phillips, Austin Hooper, JJ Arcega-Whiteside to name three). The key for the Cardinal is having the numbers to make that happen. This year, it does. Rising: Colorado coach Mel Tucker. Tough spot for Tucker: Hired in early December, after a nosedive of a second half by the Buffaloes, he took over a program that’s light on in-state talent and multiple hours (by air) from the nearest recruiting hub. The Buffs emerged with a class that, in quantity and quality, meets the threshold they needed to avoid a longer-term backslide in depth. One-third of the class, which was ranked seventh in the conference by Rivals, committed after the New Year. The 2019 class feature zero five-star players and only one four-star prospect (Luke McCaffrey). The 2018 class had zero fives and two fours. Yes, the Buffs must improve their hit rate with elite homegrown talent, but there is precious little of it. Rising: Utah coach Kyle Whittingham. The Utes are an afterthought, an eighth banana in the Pac-12 recruiting roundup, and that’s probably just fine with Whittingham. His class is low key, low in numbers and heavy on the players that fit needs. No program in the Pac-12 regularly produces a better convergence of playing style, coaching philosophy and talent pool. We’re not about to proclaim the class to be a breakthrough for third-year coach Justin Wilcox, except in one regard. The Bears signed six players from Arizona and, in multiple instances, beat out the Wildcats and Sun Devils for prospects, including four-star defensive tackle Brett Johnson. The state of Arizona possesses a rapidly improving talent pool and could serve as a complementary pipeline for Wilcox for years to come. With all the scrutiny on Herm Edwards and the so-called New Leadership Model, it was imperative that the Sun Devils present a level of general competence during the offseason, the regular season and Edwards’ first full recruiting cycle. Edwards has cleared that bar repeatedly, and his ’19 class is the latest example. That said, the numbers don’t indicate a marked improvement from the Todd Graham era. The issue moving forward isn’t the prospect ratings, of course. It’s the interconnection of evaluation and development. Not all fifth-ranked recruiting classes are created equal. If a higher percentage of signees than past years were accurately evaluated, and make steady progress within the system, then the Sun Devils will better maximize the talent. For clarity on that front, we need a few years. There are 65 teams in the Power Five, including Notre Dame. The Cougars’ recruiting class is ranked below all but four (Kansas, Texas Tech, Oregon State and Louisville). One top-10 class nationally … four top-30 classes nationally … it’s difficult to call the 2018-19 recruiting cycle an unqualified success for the conference. At the root of the problem: Poor home-turf protection. Five of the top 10 players in California are leaving the Pac-12. The top five players in Arizona are all leaving the Pac-12. So is the No. 2 prospect in Hawaii. While it’s easy to paint the home-turf troubles with a brush that’s 12 programs wide, the root cause is trouble in Los Angeles. The Bruins and Trojans simply didn’t execute to their traditional standards. That’s partly by design with Chip Kelly, whose approach to talent acquisition is heavier on fit and lighter on star ratings as any coach, anywhere. That said, buzz matters. It doesn’t matter as much as winning, but it matters. And it matters even more in the absence of winning. Right now, the Bruins have neither wins nor buzz. What they have more of than anything, out of necessity, is faith. Faith that the warp-speed nature of the recruiting cycle isn’t too fast for Kelly’s preferred approach. If the Bruins have neither buzz nor wins at this time next year, there won’t be much faith left, either. The situation might not feel as dire for the Trojans if the coaching staff had an established record of developing talent, of turning three- and four-star prospects into four- and five-star performers. But the reality is quite different: Prospects arrive on campus and either stagnate or regress over time. Combine poor development with less-than-elite talent and, over time, things could get even worse. Not a good cycle for quarterback recruiting. Not. Good. At. All. The conference signed just two of the top-10 QB prospects in the country and three of the top 20. And two of them are headed to the same place: Tempe. This isn’t cross-conference cause for alarm, at least not to the degree it would have been four or five years ago. Player movement, especially quarterback movement, has increased dramatically: One never knows when a Player of the Year candidate might materialize from the graduate transfer market. But here’s the issue: Five quarterbacks ranked among the top 20 are from the Pac-12 footprint … and headed elsewhere. Kevin Sumlin was hired so late that Arizona’s 2018 class wasn’t really his. But the ’19 group? That’s all Sumlin. And it’s a tad underwhelming, to be blunt. Ranked on the bottom tier within the conference, it’s striking on several levels, not the least of which is the paucity of players from California. The Wildcats must recruit Texas, of course. But tepid success retaining in-state players and low flow from the California pipeline … goodness, that’s a difficult combination to endure over multiple cycles. The Hotline won’t attempt to place a positive spin on the second class of the Jonathan Smith era … or a neutral spin … or even a negative spin. In fact, we’re not going to place anything on it. We’re not even going to discuss it, because prospects that may or may not impact results in three years aren’t important to the Beavers. What matters to the Beavers is 2019, and generating positive momentum for Smith’s program. In that regard, it’s all about the transfers: Three newcomers from Nebraska (quarterback Tristan Gebbia, receiver Tyjon Lindsey and linebacker Avery Roberts) plus one from Oklahoma (edge rusher Addison Gumbs) could have a greater short-term impact on OSU than any combination of four veteran players. They were all four-star recruits but aren’t included in the recruiting ratings. The Hotline made note of this trend in December, but it’s well worth a double-down. If the conference can’t control the line of scrimmage against top teams from other Power Fives, the big-stage losses will continue.